Have you often thought you'd like to build yourself a demountable camper but you haven't really got a clue where to start? Maybe you need ideas? Plans? Materials? Information? Or just inspiration? You can find them all on these pages. If you don't fancy doing the whole thing from scratch, many of the companies in the manufacturers/importers lists offer empty demountable shells for d-i-y fitting out. Working from sets of plans could be helpful - at least you know that someone has successfully done it before you! Check out the self-build plans page. 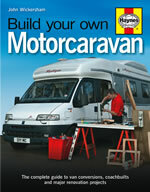 There are many companies supplying materials and equipment for motorcaravan and camper builders. You'll find most of the major, U.K.-based ones, and one or two others, here. Books, internet forums, groups, organisations and other sources of information that may have relevance if you're building your own camper. Find them here. If you're looking for ideas and inspiration, there's nothing like seeing what somebody else has done. Click here to see a selection of self-builders' blogs and websites. Everything you might need to build your own demountable camper - except perhaps the confidence, the skills ... oh, and the money of course! This page contains routes to websites with particular relevance for self-builders and, whenever possible, with specific reference to demountables.